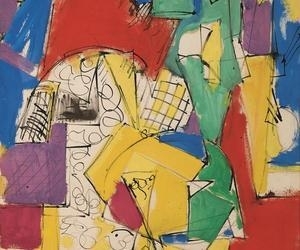 The most comprehensive retrospective exhibition of works on paper by the Abstract Expressionist Hans Hofmann is now on view at Museum of Contemporary Art Jacksonville, a cultural institute of the University of North Florida. 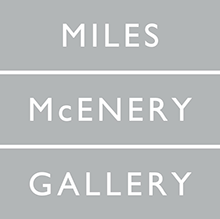 Curated by Wall Street Journal contributor Karen Wilkin and Marcelle Polednik of the Milwaukee Art Museum, this survey of 80 multimedia works, spanning the half-century from about 1914 to 1965, is an entrancing celebration of the thoroughly energized, richly hued works. German-born Hans Hofmann (1880-1966) was the first person to formulate a set of principles for understanding modern art, making him one of the century’s most important teachers. He based them on his intimate acquaintance with Fauvism, Cubism and its lyrical offshoot, Orphism, while in Paris from 1905 to 1913, and years later, while back in Germany, with Surrealism. Crucial to Hofmann’s art and his teachings first in Germany and then in the U.S., where he settled in 1932, was his belief in relying on the overall perimeter of the painting’s surface as a key compositional guide while working improvisationally and intensifying differences between warm and cool colors—known as “push and pull,” based on the colors’ appearance of advancing or receding. His teaching served as a foundation for several generations of New York School artists. Among his many students are such luminaries as Louise Nevelson, Larry Rivers, Allan Kaprow and Helen Frankenthaler. Perhaps, because of his years devoted to successful teaching, this German expatriate and pre-eminent New York School painter achieved the acme of his highly invigorated style in the 1940s and ’50s, between ages 60 and 80, at a time when most artists are content to recalibrate their earlier successes. The Hofmann retrospective is thus not only an intimate look at a major painter’s works on paper but also a paean to his fecund old age, when new ideas were so life affirming that his hand found ways to sustain and even extend his inspiration’s surging force. This exhilarating retrospective of intimate works, which will be shown at the Portland Museum of Art, Maine (June 16-Sept. 10, after closing in Jacksonville on May 14), divides Hofmann’s work into 10 categories, including Self-Portraits, Europe, Discovering America, Expanding Imagery, and Late Works. The exhibition begins with self-portraits, including two hieratic works from about 1941 that plot the artist’s features on Cubist-like grids. Even more revealing is the group of untitled, casual India ink sketches from 1942 clearly picturing the artist seated while holding a board with prominent paper-clips to secure the sheet on which he was working. These representational works provide insight into this artist’s athletic way of drawing—his crouching, humped-over body enacting the type of energetic force for which his art is justly famous. In the catalog, the curators and additional essayist Diana Greenwold of the Portland Museum of Art attribute the irrepressible ebullience of Hofmann’s art to his initial experiences of America’s technological prowess and the country’s expansive horizons. But I believe the Surrealism to which Hofmann was first exposed during his European years served as the actual source of his mature and far more abstract style. The poet leader of this international group, André Breton, defined Surrealism in terms of heightened contrasts between two or more distant realities to achieve vital and surprising flashes of insight, after an initial period of free association. Hofmann’s magisterial set of improvised, colorful crayon-and-ink scenes of Provincetown, Massachusetts’ traditional New England architecture, bay and sailing vessels that he created between 1941 and 1943—certainly the highlights of this exhibition—aggressively contrast the disparate realities of representation and abstraction in works notable for their raucous and unabashed color. Besides, his “St. Tropez (Seen from St. Raphael Mountains)” of 1929 is infused with this so-called American energy, and it was painted the year before his first trip to the U.S. In recent years, there has been growing interest in Abstract Expressionist drawing, no doubt because of its ability to convey an artist’s initial thoughts and subsequent way of working. We see this in a work like “Sun House on the Hill” (1943), where moments of hesitation are then punctuated with flashes of inspiration. Studying Hofmann’s drawings, one comes much closer to his distinct touch, intimate connection with emergent ideas, and feeling for the capabilities of his preferred media: gouache, crayon, India ink, oil and watercolor. The delicate vibrancy of this last medium is readily evident in the 1943 untitled work on loan from the Museum of Fine Arts, Houston. While the exhibition emphasizes Hofmann’s drawings from the 1930s and ’40s, there are a few highly suggestive late works in the exhibition, particularly several untitled pieces from 1961 in which the artist contrasts a few seemingly carefree drips and spatters of richly hued oil paint with delicate felt-marker traceries. They make one wish for more works from Hofmann’s final decade when this ever-innovative octogenarian artist began investigating new possibilities with minimal yet evocative means.